Helpful 6 Quad Strengthening Exercises for Bad Knees - My Fitness Closet! Top Quality Apparel! Bad knees can put a real downer on your fitness routine. But while it may seem intuitive to rest painful knees, the better solution is actually to strengthen them with gentle movements. Your knee is supported by two main muscle groups: the hamstrings and the quadriceps (quad). The quad is found on the front of your thigh, while the hamstring muscles make up the back of the thigh. Injury or knee pain often occurs because the muscles supporting the knee are weak. By strengthening the muscles which brace the knee, you will have better support and stabilization for your knees. This in turn will help reduce the amount of stress positioned on the knee joint. To strengthen your knees, you must keep your quad and hamstring muscles strong. There are several quad exercises for bad knees that you can do for this purpose. What Is The Quad Muscle? The quad is attached to the kneecap (patella), which, in turn connects to the shin bone (tibia). There are four distinct muscles that make up the quadriceps muscles. These muscles, on the front of your thigh, are called the vastus intermedius, the vastus medialis, the vastus lateralis and the rectus femoris. When your quads contract they straighten the knee and extend your leg. Since they extend over the kneecap (patella) they also help to keep your kneecap in its proper position. Step-ups are good quad exercises for bad knees. They help increase power and coordination in your leg muscles. How to do them: For this exercise, you will need an aerobic step bench or a staircase. Position yourself in front of the step and step up onto it with your right foot. Tap your left foot on the top of the step and lower it back. As you step up, your knee should be directly over your ankle. Repeat the movement with your left foot. Depending on your comfort with the exercise, you may add ankle weights. This multi-joint exercise will build power in your leg muscles and is a good, muscle strengthening exercise for bad knees. It targets not only your quads but also glutes and hamstring muscles. How to do them: Stand with your back straight, your feet shoulder-width apart and your toes pointing either straight ahead or slightly out to the sides. Slowly lower you body, pushing your hips as if you are sitting on a chair, bend your knees at a 90-degree angle if possible and keep your knees in line with your feet. Keep your abs straight and hips clenched as you return to standing position by pushing through your heels. This is an excellent exercise for bad knees and if you can do it standing up, it will not only strengthen your muscle but also improve stability and balance. 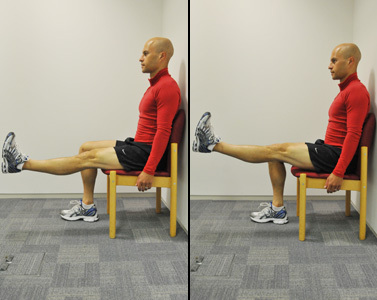 How to do them: Sit in a chair with your feet on the floor and march your legs up and down, one at a time. Lift up and your knee and foot, lower it down, and repeat. Try doing this for about a minute, twice a day. To keep your knee from getting stiff, you can do it any time you find yourself seated for more than twenty minutes. If you try it standing, try to slightly propel your feet forward in a lunge and then bend. If you are new to this, it’s best not to begin with lunges. The quads help control the speed of movement when you extend and flex your knees. Short arcs are quad exercises for bad knees which strengthen the quad muscles without much knee movement. How to do them: Lie flat on your back or sit up with your leg horizontal on a flat surface such as a bed. Place a rolled towel under your knee and pull your toes towards yourself as you clench your thigh muscles. Slowly lift your foot up off the bed until your knee is straight. Hold for 3-5 seconds and slowly lower. Repeat the movement 10 to 20 times daily. Repeat with your left leg. Only do this exercise if the repeated extending and flexing don’t cause pain. Another recommended exercise for bad knees is the isometric quad exercise which focuses on strengthening the muscle while it’s in a static position. How to do them: Sit in a chair with your back straight and your head facing forward. Your thighs should be parallel to the floor and your feet flat. Hold on to the sides or the arm rests of the chair with your hands and lift your right leg up, your foot flexed till it’s parallel with the floor and tense your upper thigh muscle. Hold this position for 6 to 8 seconds and release. Repeat the movement with your right leg 8 to 10 times and then repeat with the left. You may increase the intensity of this exercise by wearing ankle weights or a resistance band. Remember to breathe during each isometric exercise and expect for your quads to get tired. This is a strenuous work out. Steady, even breaths will make quad exercise for bad knees much easier. This exercise for bad knees strengthens the quad muscles without bending the knee. However, refrain from doing this if you have a history of back problems. How to do them: Sit with your back against a wall, and keep your left leg straight and your right leg bent, with your foot flat on the floor. Slowly raise your left leg up, about 12 inches off the floor, hold, and then slowly lower. Pull your toes towards yourself and keep the thigh muscles tightened, and your knee straight. Repeat the movement with your right leg. Do this 10 to 20 times daily. Exercises that involve excessive flexing, particularly those with weights, such as full squats or leg presses aren’t suitable exercises for bad knees. Jumping exercises or those which involve sudden stops, starts and pivots such as basketball or tennis can also be tough on the knee joint. Walking is a good exercise for bad knees. Swimming (apart from the breast stroke) and bicycling are also good, as they aren’t too strenuous or high-impact. It is important to remember that not all physical activities or exercises will strengthen the muscles you need to support your knee joint. So, when planning your workout, be sure to include hamstring and quad exercises for bad knees. Consult your doctor before you start any new exercise. Your bad knee may be better or worse than the next person, and you need to choose a workout that caters to your needs.